LOCAL SOUTH OXHEY COUNTY COUNCILLOR JOAN KING has ensuref that children at a pre-school will be able to enjoy learning and playing in a new garden. Joan allocated £500 to Warren Dell Pre School towards the cost of providing shelter, plants and equipment for their outdoor space. The garden will also inlcude a wild sensory flower area, a patch to grow vegetables, an area to climb and a place to play and read with shelter from the weather. 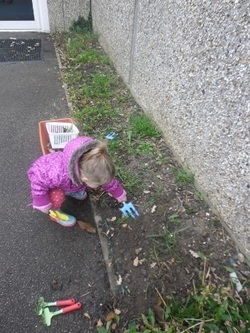 Cllr Joan King said: "I visited this pre-school in the summer and was made most welcome by the staff and shown around the outside space that they would like to make into a garden for the children to enjoy. The staff are dedicated and I am sure the children will enjoy many happy hours in the garden when it is completed."